For other people named Sam Anderson, see Sam Anderson (disambiguation). Sam Anderson (born May 13, 1945) is an American actor. He is best known for his roles as Sam Gorpley on Perfect Strangers, as dentist Bernard Nadler on Lost, and as Holland Manners on Angel. Anderson was born in Wahpeton, North Dakota. He is a graduate of the University of North Dakota in Grand Forks. During the 1970s, he taught drama at Antelope Valley College in Lancaster, California. Anderson is best known for his roles as mailroom supervisor Mr. Gorpley on Perfect Strangers, the lawyer Holland Manners on the first two seasons of Angel, the cardiologist Dr. Jack Kayson on the television series ER, and as dentist Bernard on Lost. He is also known as the assistant manager of the Hotel Royale in Star Trek: The Next Generation episode "The Royale", and as Mike Seaver's adversarial Principal DeWitt on Growing Pains. In addition, he was one of the recurring actors on various episodes of WKRP in Cincinnati, playing various roles, including an immigration officer in the episode "The Americanization of Ivan". 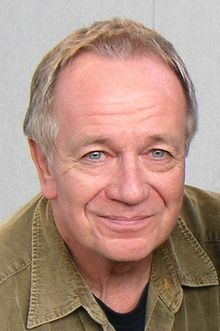 Anderson has guest-starred in Season 8 of NCIS as Walter Carmichael, a middle school teacher whose classroom becomes a crime scene when one of his students is kidnapped. Anderson married his wife, Barbara Ann Hancock, in 1985. Together, they have twins. Sam holds advanced degrees in Theatre, American Literature and Creative Writing. He is also a member of the Mystery Writers of America. Criminal Minds - Season 4, "House on Fire"
Star Trek: The Next Generation - Assistant Manager in the episode "The Royale"
Alien Nation - Thomas Edison in the episode "The Game"
The Adventures of Brisco County, Jr. - Simon Wolfe in the episode "Brooklyn Dodgers"
The Pretender - Dr. Curtis Season 2 "Over the Edge"
The X-Files - Leamus in the episode "The Pine Bluff Variant"
Medium - Dr. Elliot Peterson Season 2 "Time out of mind"
Nowhere Man - Memory man in "Through a Lens Darkly"
NCIS - Walter Carmichael Season 8 "Worst Nightmare"
^ "Exclusive: Which Lost Castaway Is Crashing onto NCIS?". TVGuide.com. Retrieved September 8, 2010.